Messier 38, The Starfish Cluster, is located some 4,200 light years away in the constellation of Auriga. 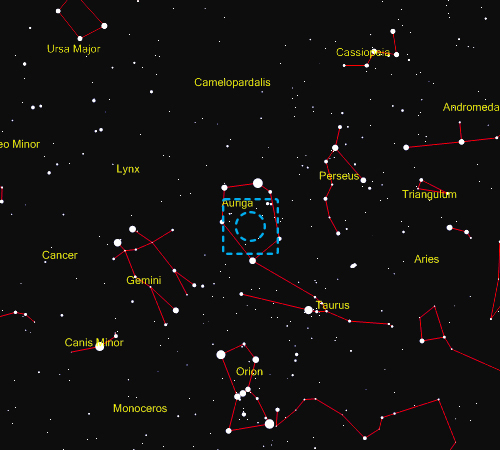 It is quite easy to find as it is located within the polygon of the brightest stars of Auriga. 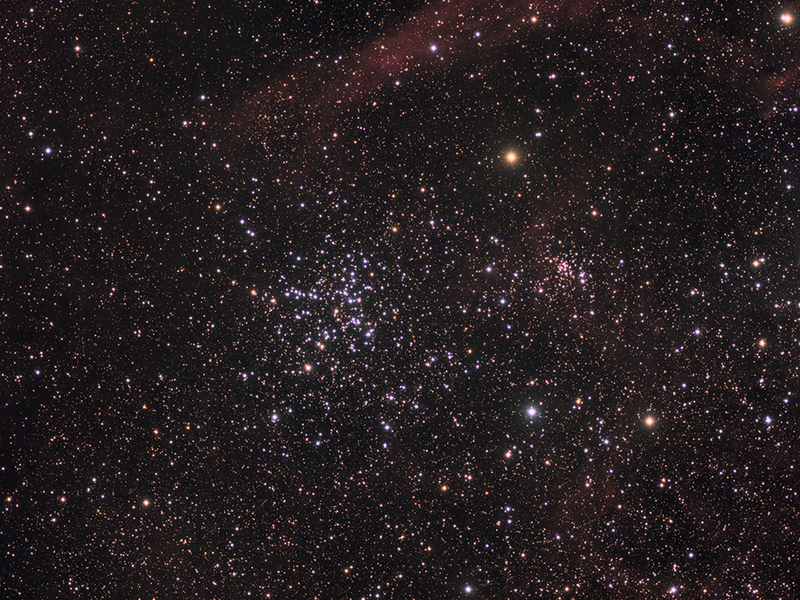 M38 is best observed during the winter months when it rises high for northern observers. A small or medium sized telescope with low magnification is sufficient to view the cluster. Indeed, this view is perhaps the best in order to see the shape that has given rise to the cluster's name. Its shape has also been described as the Greek letter π, an oblique cross and an irregular arrow. While perhaps it is possible to make out some of these shapes in this image, the sheer number of stars that this long exposure reveals, compared to a visual observation, makes it rather difficult. M38 was discovered before 1654 by Battista Hodierna. At the same time, he discovered the nearby clusters Messier 36 and Messier 37. M38 was then independently discovered, along with M36, in 1749 by French astronomer, Guillaume Le Gentil, a very interesting and rather ill-fated astronomer. It is worth reading the account of his journey to view the 1761 transit of Venus for Halley's measurement project - look on line for the full story. It was not until the night of the 25th September 1764 that Charles Messier discovered the open cluster, noting of what would be catalogued as M38 that 'this one is of square shape, and doesn't contain any nebulosity'. The estimated age of the cluster is 220 million years. It contains around a hundred stars, including its hottest member, a class B5 star, a number of A-type main sequence stars and several G-type giants. M38 is classified as Trumpler type II,2,r, which means that it is a detached cluster with little central concentration (II), that its stars have a moderate range in brightness (2) and it is rich with more than 100 stars (r). Messier 38 has an angular size of about 23 arc minutes and a diameter of about 28 light years. The cluster has a total mass of around 1000 solar masses, giving it an average density of approximately 0.1 solar masses per cubic light year. The Starfish Cluster is not alone in this patch of sky, M36 and M37 are nearby and the small open cluster, NGC 1907, is clearly visible to the right of M38 in this image. One theory put forward to explain why Auriga contains so many star clusters is that they were formed within the same molecular cloud. This may hold some truth and it is clear to see that this is a very dusty region of space. However, the relationship between M38 and NGC 1907 appears to be that they are simply passing each other by at this point in time. Astronomers have determined that NGC 1907 is much older at around 500 million years old, the distance between clusters is about 1000 light years and models of their spatial velocities, radial velocities and proper motion suggest that they were born in different regions of the galaxy.